While travelers living in the lush and warm climate of the Southern Hemisphere plan to celebrate the winter holiday season on white sandy beaches, other informed adventurers opt to travel and rejoice in the natural frozen beauty and warm cultural traditions of northern European Countries. For close to a decade, Nordic Travel Specialist, 50 Degrees North has been educating travelers of the benefits and unparalleled range of experiences available year-round, and specifically the winter holidays season, in destinations above the 50thparallel. The company’s unique product offerings, self-guided and small-escorted tours have convinced travelers to venture further afield to these foreign regions. 50 Degrees North’s native staff and destination experts have compiled their favorite seasonal adventures which promise to entice and convince travelers to place Scandinavia at the very top of their travel bucket list. Scandinavia has all the ingredients to ignite a travellers’ inner-child over the winter holiday season. A visit to Christmas markets is a must when visiting Scandinavia during the holidays. It is the quintessential Christmas tradition for locals all across northern European countries. The markets in larger cities such as Stockholm, Gothenburg and Copenhagen rank amongst the world’s best. Traditional delicacies such as roasted chestnuts, gingerbread cookies, sugar roasted almonds and old fashioned candy are some of the favourites. Northern cuisine has become characterised as delicately served plates and rather minimalist servings, however, when it comes to the festive season, traditional smörgåsbord buffets come to the fore. Traditional Christmas meals tend to differ across the regions. Norwegians feast on reindeer stew, mashed potatoes and lingonberry while others prefer baked hams with mustard, roast pork, salads and whole baked salmon. 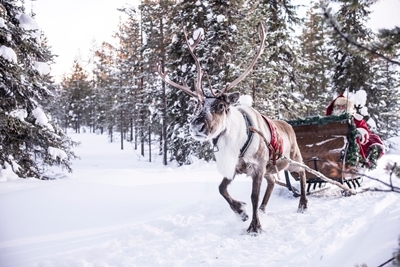 A reindeer safari is a lovely, relaxing way to enjoy the winter scenery. These are usually hosted by local reindeer herders and will give travellers an authentic opportunity to chat with the locals and learn more about indigenous Sami people. 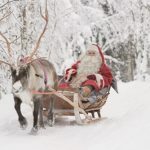 Those who do not wish to sled can also visit a reindeer farm and feed lichen to the reindeers. Lassoing reindeer antlers sitting on A frames, walking amongst the reindeers and enjoying local Sami hospitality are also ways to learn about these Northern traditions. Dogsledding is a more action-packed way to explore the frozen wilderness, whether it is for just 15 minutes or several hours. Being led by eager and friendly huskies through the breath-taking snowy landscape is a truly exhilarating experience! Dogsledding comes in a few different options. At a minimum, 50 Degrees North recommend having half an hour at least sledding so you can fully enjoy the peace and quiet of this activity. Guests can either sit on a sled with a guide or push their own sled, single or with a partner, swapping half way. This is quite tiring but a lot of fun. It isn’t hard to learn how to ‘mush’ your huskies and the guide will be watching the group very carefully to make sure it is safe and in control. By far the fastest and most adrenalin-infused way to get around in the snow is by snowmobile. Usually lasting for two hours with a coffee break or four hours with a lunch break over an open fire, this is another unique way to see some of the best scenery the region has to offer. Again, travellers either ride together with a guide, partner up with a friend or pay a little extra to have their own snowmobile. Although travelers are likely to see the Northern Lights from the vicinity of their cottage, there is something very magical about a specially designed trip – by horse, reindeer, husky, snowmobile or even better from a heated glass igloo- to chase the green glow of the aurora borealis. The haunting beauty of the aurora provides fantastic photo opportunities for amateur and professional photographers alike. In most Nordic winter destinations, having a sauna is certainly an essential part of the experience. Travelers can stay in for as long or as little as they like – it is best to listen to the body and let it relax with the heat. And by far the best way to finish off the sauna experience is by dipping into a frozen lake through a hole cut into the ice. It sounds intense, even scary perhaps, but it is one of the greatest feelings one can experience! If adventurers can resist the temptation to run back into the sauna, their body will very quickly heat up on its own accord and feeling tingly and warm for a long time after. Indoor and outdoor spas/ hot tubs also feature widely in Scandinavia. “Our knowledgeable Scandinavian born and raised staff know how to plan memorable winter holidays. Their personal experiences and traditions are reflected in the diversity and originality of our itineraries”, says 50 Degrees North’s co-founder and president, Tietse Stelma. “Clearly we are great destination advocates and truly believe that nothing beats a Scandinavian holiday at this festive time of the year. We invite travelers to start planning their 2019 visit sooner than later. The world is discovering this gem of a destination, popularity is on the rise and space can be limited”, added Stelma.